After testing the feature with select users, WhatsApp started rolling out the awaited internet calling functionality to a wider set of people, last month. However, to get the voice calling feature activated users needed to receive a call from a user who had the service already turned on. The feature is still not available yet on the iPhone. It also doesn't work on Windows Phone handsets, at the momen. 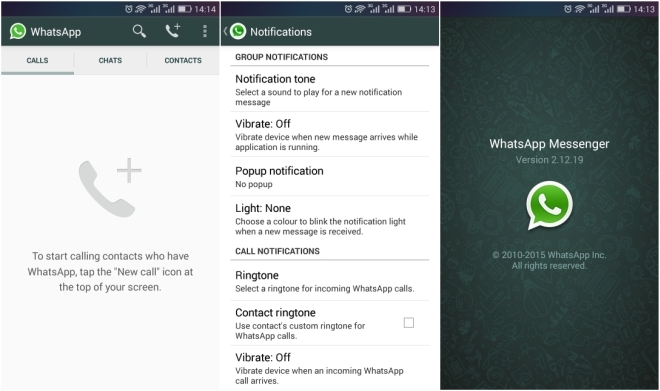 After activation of the feature, WhatsApp's user interface changes to feature separate screens for dialing a voice call to WhatsApp contacts, call logs and ongoing calls. The chat window also displays a calling button (represented by a phone icon). The active call screen sports buttons for turning on the loudspeaker, switching to the chat window and for muting the call.